Whether you love or hate spreadsheets, we all need them. Spreadsheets have revolutionized data since the 1980s when they were the “new kid on the block.” Every accountant swears by them and business analysts spend hours trying to make sense of the rows and rows of numbers. But, for the human mind, a picture is still worth a thousand words. These very same business analysts are looking to go beyond the pie charts and graphs of these spreadsheets. Today, there are massive amounts of useful data available. We now capture different types of data, often in real-time. Spreadsheets are ill-equipped to cope with these new data sets and data visualization is not built into their DNA. It’s time to look forward to stay competitive. Big data is a reality of business today and it’s growing exponentially. Its size requires cutting-edge analytical tools that can also bring together artificial intelligence and machine learning. By pulling together and comparing all these data points – that until now, sat in different silos – correlations that were hidden before begin to appear. These uncovered insights help businesses make smarter decisions. 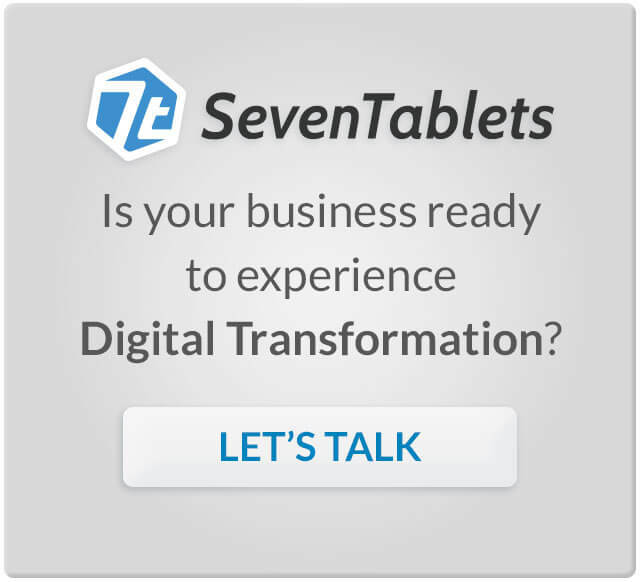 Data visualization is available for most predictive analytic tools, including SevenTablets’ tool, Sertics. Data visualization is the graphic interface for the hectic background activities of data mining, data storage, data analysis and data sharing. What’s more, for the first time, interactive visualization is running millions of simulations by tweaking different data points and variables until we can identify a pattern. These patterns help us discover ways to solve problems, streamline operations, increase revenues and/or save money. Today, more than ever, organizations are using data visualization to ask better questions. Businesses across the spectrum, from finance, manufacturing and logistics to e-commerce and service industries, have adopted Predictive Analytics software that is changing the corporate landscape in very definite terms. A few of the many benefits are as follows. Before data visualization, business reporting failed to present the entire picture in a timely manner. This meant that hours were spent trying to understand the information rather than converting knowledge into action. Today, data visualization brings all this disparate information together and makes it interactive – the true big advantage of data visualization. Business leaders now empower their employees to make better decisions through Predictive Analytics and data visualization. It’s no longer the domain of a few technical professionals. Better strategies at every level of the decision-making process, across the organization, are now a big part of forward-looking businesses. The business impact can be best illustrated by a footwear brand that had all the data they needed collated from their global distribution centers and assimilated into the company’s predictive analytics tool. It went beyond sales data; they could find their highest selling products and analyze them further by geography and demographics. Revenue statistics could also be shown with one click. They created a strategy to optimize new locations and elevate underperforming ones. A visual representation of data alone is not valuable; It’s only when visuals are presented in context that they can transform business dynamics. Predictive analytics software can show the connection between daily tasks and the long-term outcomes in business performance by providing a multi-faceted view of business and operating dynamics. For instance, a pipeline report to show where each deal halts in a sales pipeline empowers the sales director and his sales team to spot problems immediately and take actionable steps to turn things around. Competitive monitoring is not a new idea. Businesses have already been keeping a watch on the companies that are dominating the market and newcomers who could pose a threat. Coke and Pepsi have traditionally been so focused on each other that they were caught off guard when Red Bull came along and became an industry leader. The truth is that your customers don’t just engage with one or two businesses that deal with the same product or services. Understanding your customers purchasing behavior outside of your business gives you a competitive advantage. Searching the internet for information is time-consuming and not everything on the web is reliable. You would not want to base your decisions on wrong information. Make sure that the analytics tools you choose are proven for competitor monitoring, including social listening, press releases, investor news, market figures and more. The data visualization will help you to see all this data on one dashboard with multiple filters to provide you a goldmine of information. If you’re interested in anticipating the future events that will impact your business and leveraging data visualization to understand the ins and outs of your market, call SevenTablets today. Our Predictive Analytics platform, Sertics, will help your team create a comprehensive data lake, apply predictive analysis and interact with easy-to-understand data visualizations. Predictive Analytics vs. Big Data: How Do These Technologies Differ?